Cassini looks upward at the south polar region on Rhea during a recent distant encounter. 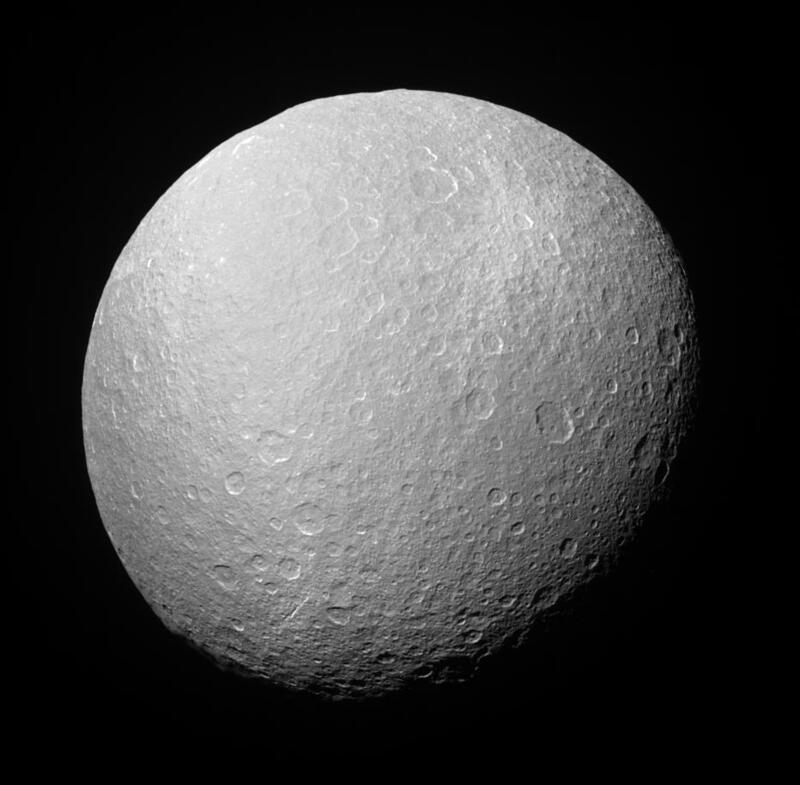 Rhea's icy surface is so heavily saturated with impact craters that the moon's limb, or edge, has a rugged, bumpy appearance. Rhea is 1,528 kilometers (949 miles) across. The bright splotch seen here near the upper right is impact material (or ejecta) from a relatively fresh crater (see PIA06648 for another view of this bright feature). The image was taken with the Cassini spacecraft narrow-angle camera on July 14, 2005, at a distance of approximately 342,000 kilometers (212,000 miles) from Rhea and at a Sun-Rhea-spacecraft, or phase, angle of 36 degrees. The image was obtained using a filter sensitive to wavelengths of infrared light centered at 298 nanometers. The image scale is 2 kilometers (1 mile) per pixel.